A Handmade Life: Excuses, excuses. Well, since I've been making excuses for my knitting (or lack thereof) lately, how about this one? I just can't get to it right now...no, really. I actually can't get to it. 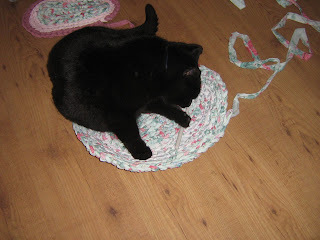 Every time I make these rugs, one of my cats wants to be there. Every time! When I had the sheets out on the floor and was cutting them, my other cat thought she might like to park herself right in the middle of the cutting area. As soon as I brought this one upstairs to work on it, this cat plopped herself down and she was not moving. The funny thing is that I have 4 of these rugs in other places in our house. They could go hang out on any of those that are already finished, and actually have room for a whole cat. But no, they like to be on the one that I am working on. Ah well, it makes me laugh every time too. My cats do the same thing with every project I work on. They just HAVE to be the center of attention. :) But sometimes they get too close to the scissors - yikes! Thanks for the funny story. They really do have to be the center of attention, that must be it. It just cracks me up every time, because there are so many better places that they could be having a rest, but nooooo.